NOTICE: Activation key must be used on a valid Steam account. 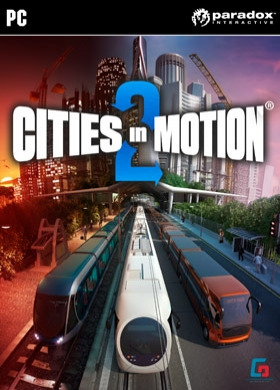 Requires internet connection.ABOUT THE GAMECities in Motion 2 (CIM2) is the sequel to the popular mass transit simulation game Cities in Motion. Build, manage and lead your transportation network to provide cities with their ever changing needs. CIM2 introduces new features including multiplayer game modes, day and night cycles, timetab… les and dynamic cities. Building the transportation network will directly affect how the city grows. Affordable transportation brings middle class housing and work places, while more expensive and exotic choices bring high end businesses. Take advantage of many different types of vehicles including buses, trams, ferries and more. Build alone or play cooperatively with a friend. Use the newly implemented bus lanes to build efficient traffic free roadways. Tackle rush hour by managing transportation timetables and meeting the needs of the citizens. KEY FEATURES Dynamic cities Player’s choices effect city growth	Day and night cycle	Manage the timetables Multiplayer with both co-operative and competitive modes	Campaign and sandbox modes	SYSTEM REQUIREMENTS Windows Operating system: Microsoft Windows XP/Vista/7/8 Processor: 2 GHz Dual core Memory: 3 GB RAMHard Drive: 2 GB free hard disk space Video: nVIDIA GeForce 8800, 512 MB RAM or ATI Radeon HD 3850, 512 MB RAM DirectX®: 9 or aboveMac Operating system: OSX Snow Leopard 10.6.3 Processor: 2 GHz Dual core Memory: 3 GB RAM Hard Drive: 2 GB free hard disk space Video: nVIDIA GeForce 8800, 512 MB RAM or ATI Radeon HD 3850, 512 MB RAM Linux Operating system: Ubuntu 12.04 LTS Processor: Intel Core Duo Processor (2GHz or better) Memory: 3 GB RAM Hard Drive: 2 GB available space Video: nVIDIA GeForce 8800, 512 MB RAM or ATI Radeon HD 3850, 512 MB RAM Additional: GLSL 1.3, OpenGL 2.1. Paradox Interactive, CITIES IN MOTION® Copyright©  Paradox Interactive AB All rights reserved.